I like history adventuring. I like going out and looking at Arizona scenery, and old buildings, and my friends know that I'm a much better sight-seer than driver, so I leave the driving to them. And one thing that I've discovered recently is that a lot of people show up hungry. So, while going to get food isn't what a history adventure is all about, I have several places in mind that fit into the same category of places that people may have gone past for years, and never realized that they were passing a gem. 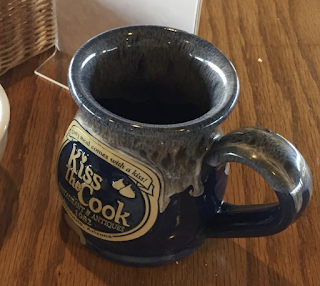 Kiss the Cook in Glendale is one of those places. No, I'm not getting paid to say anything about them, I am just so glad that they're still there, as they've been around as long as I can remember. I just visited their website and it looks like they have been there, on Glendale and 49th Avenue, since 1982. But it isn't the fact that they've been there for over thirty years, it's the feeling you get there. It's one of those places that makes you think you're in the attic of your grandmother, except of course, it's a restaurant. Back in the bad old days before restaurants became non-smoking, I used to have to squeeze in the tiny space in the back, but nowadays I can sit in the main area. They're mostly a breakfast place, so be sure to get there before 1. And take me along!